After spending the day in the AA Flagship Lounge, it was time to fly to Doha aboard Qatar Airways’ new Qsuite Business Class. The flight departed from Gate 14, jut a few paces from the lounge. I was unable to check-in online since my destination was Vietnam, which requires a visa for U.S. travelers. Instead, I checked in at the gate. When the agent asked for my visa I simply handed him a printed copy of my connecting flight on Vietnam Airlines from Ho Chi Minh City to Frankfurt. My boarding pass indicated an 8:20p boarding time, one hour prior to departure, but we started boarding at 7:55p. I was among the first to board and there was not yet a FA at the door to greet passengers. Instead, I found my way to my own seat, stopping to take pictures of the beautiful new Qsuite cabin. Pictures of the cabin itself were difficult due to the high walls of each suite. Even so, I could immediately see that the new business class product was beautiful. Note the beauty of the Qsuite concept. Privacy dividers can be lowered to create a larger “suite” for two and as many as four passengers. In the center section, four seats face each other, we with two forward-facing and two rear-facing. While the seat is not quite as spacious as a true first class seat, you have more privacy than many first class products. That makes Qsuite a revolutionary product. The seat itself is incredibly comfortable in all positions and the side storage compartment acts as an armrest/shelf, providing even more space. I love how well-thought out the suite was: it was elegant without being gaudy and the storage solutions, placement of seat controls, and lighting were all at optimal positions inside the suite. Individual air nozzles are provisioned! With the doors closed, the suite felt quite private. The wall isn’t too high to prohibit it, but twice when the FA needed something he opened the suite door rather than peered over it. Waiting on my seat was a light blanket and pillow. I loved the message on the pillow. After the meal service I requested that my bed be prepared and a mattress pad, plush pillow, and velvet-like comforter were added. I slept soundly for about six hours. 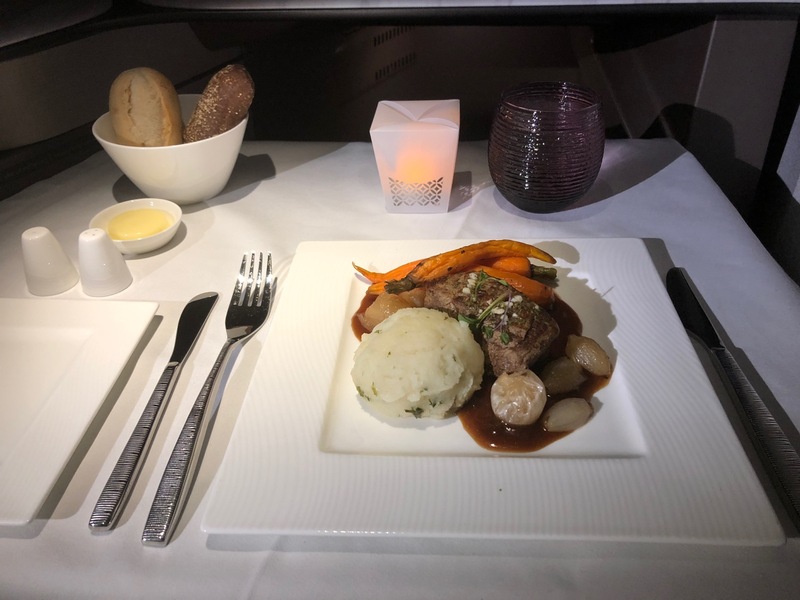 Qatar Airways offers à la carte dining in Qsuite business class. Menus were presented prior to takeoff. After takeoff, I was offered a choice of beverage along with warmed mixed nuts. I ordered rosé champagne and sparkling water. The sparkling water was served immediately, but it took about 10 minutes for the champagne to arrive. Refills on nuts were offered. The table was set for dinner and Qatar’s longhaul place settings now include a faux candle (like Turkish Airlines) and an attractive purple water tumbler. An amuse bouche of salmon filet (sprinkled with caviar) with crab and lobster meat was offered. I ate it, but neither are my favorite. Qatar Airways offers business class passengers a pre-selected bread basket. Unfortunately, the bread was not warm and did not even taste fresh. For my first course, I chose butternut squash soup. Qatar Airways never disappoints on soup and this was delicious. Next, I had an antipasti salad, which included marinated olives with parmesan cheese, artichoke salad with pine nuts, and Mediterranean vegetable salad (zucchini and squash) with pesto. It was served with rosemary focaccia bread. The bread wasn’t fresh or warm once again, but overall the appetizer was delicious. I ordered steak for the main course, hoping (and even requesting) that it not be served well-done. My advice is to avoid steak on Qatar Airways. I continue to order it in hopes I’ll one day receive that perfect cut, but I should know better by now. The meat is consistently of good quality, but always cooked well-done and dry. At least the mashed potatoes and carrots were tasty. The “gourmet ice cream” for dessert was chocolate and vanilla. I was already full and this felt much lighter than lime and coconut panna cotta. > Read More: Is Compensation Due When a FA Fails to Wake You Up to Eat? My breakfasts on Qatar Airways always being with the same thing: a smoothie and fresh-squeezed orange juice. Followed by French Toast, which was excellent. Cappuccinos are “real”, not powdered. I almost always order eggs for breakfast on a plane, so was happy to try something different this flight. Overall, the meal service was satisfactory and still very much above average. I was disappointed the bread tasted almost stale and the steak was overcooked, but I love the dine-on-demand menu and the many choices on it. Qatar Airways uses Bric’s amenity kits for business class passengers. These hard-shell cases contain Monte Vibiano toiletries, an eyeshade, and socks. Other amenities like shaving kits, combs, and dental kits are available inside the lavatory. Pajamas are provided on Qatar mid- and longhaul flights. The pajamas on this were produced by The White Company and were soft and comfortable. I like that both the pants and shirt have pockets. Slippers were also provided. The onboard lavatory for Qsuite passengers was not huge, but spacious. I mentioned above that it contained additional amenities not found in the amenity kit. FAs keep it clean, for it was spotless even at the end of the flight when I changed out of my pajamas. While Qatar Airways is in the process of installing wi-fi internet on its 777s, this flight had no internet. I think that puts Qatar at a huge competitive disadvantage (versus Emirates and Etihad), but at least I had prepared for it in advance. The IFE selection is excellent, with hundreds of movies, games, audio, and TV shows. Qatar also provides noise cancelling headphones, which are not of the best quality, but still do the job. Service was actually disappointing, though perhaps that reaction is a product of great expectations rather than objectivity. The good: reasonably attentive service, attention to detail, and friendliness. The bad: slow execution, no anticipation of needs, and failure to address me by name. On the last point, it’s not that I need to be called by name…I really don’t. But many carriers do address passengers by name in business class. I also think it displays a higher level of service. Thus, for comparison purposes it merits mentioning that FAs did not address passengers by name on this flight. With the lights darkened and me changed into pajamas, it would have been nice to have offered to make the bed as well. It’s not like I could even do it myself, because the bedding was in a cabinet near the galley. I concede that this borders on “nitpicking” and the service was truly above-average. But, if Qatar wants to offer the best business class product in the world, I think service can improve. With a strong tailwind, we landed nearly 90 minutes early in Doha. It had been far too quick a flight. Qatar Airways has revolutionized the business class hard product with Qsuite. I cannot think of a better business class hard product. Service is not flawless, but nevertheless excellent. Throw in great IFE and a dine-on-demand menu and you have a business class product I wholeheartedly endorse. Next Article Which Sandwich is Best in Qatar Airways Al Mourjan Lounge? Can you tell me how you booked flight? And how many days before you booked award ticket? Cant wait to try it! Booked with miles? How would you compare this to Qatar’s first class product? I’ve never flow it but from what I’ve seen in pictures it doesn’t seem to offer anything in the way of an advantage over QSuites. Great review thank you. I had the chance to look at the suites recently at T5 JFk where Qatar has set up a full bank of seats and it truly seems like an exceptional hard product. I was especially impressed by all the inseat storage which seems to be an area where many other seats falls short. I slightly prefer first class, but will be doing a comparison post in the days ahead. I haven’t been able to find any QSuite award availability from New York or Washington on the BA site. Really disappointing as I want to try this out with my wife! I agree about QR’s bread service. It’s one detail they consistently overlook. I’ve never had seconds with their bread because it’s always cold and stale. Otherwise, everything about their soft and hard products are excellent. Recently flew JFK to Doha and then in to Male. Unfortunately as my plane was a morning flight I didn’t get the Q-Suite. However I did notice all the flight attendant costume changes! I think there were four in all! I appreciate your blog very much, and have many friends here in Guatemala who are frequent readers as well! How can I know which aircrafts or routes have the new QSUITE? Is it all the A350´s? Thanks so much! Great review Matthew. Thank you. I don’t think you’re being nitpicky at all. The difference between airlines is on their attention to details. The experienced business or first class traveler WILL know when things aren’t up to par. I’m sure these airlines have service guides and people that read the internet blogs. Hopefully corrections will be made for the shortfalls. I like the Bric’s amenity kits .They are useful for cords/cables and bits and pieces. Nicer than Rimowa, IMO. Bric’s luggage is nice but not commonly seen. The arcade adjacent to the Park Hyatt Milan has a Bric’s store but I’ve not seen it elsewhere. I usually decline breakfast but most airlines will offer it again once the FAs see that you are awake ( exception: American Airlines. I dared to ask for a coffee..plain black…and one of the grumpy grannies snarled: “You said you didn’t want breakfast but I’ll see what I can do”. This was at least an hour before landing. Apparently coffee is breakfast. Just a little constructive feedback. As also a lawyer and a business owner I would hope these kinds of errors don’t carry over into your other lines of work! @emercycrite: I really appreciate you taking the time to point out these errors. I’ve now corrected all of them. If I can justify myself (there is no excuse really) but the blog is simply a hobby…something I do for fun…a break from my day. My other businesses require 8-10 hours per day so blogging is part of my morning routine between breakfast and working out. This morning, I was really running short on time…and it shows. I figure if it works for Gary Leff, it can work for me…but I’ll try to do a better job. Thanks for listening (reading…?) Matthew. As I mentioned it’s just some constructive feedback for you; you already have a lifelong reader here thanks to your incredible pictures of the TWA Flight Center. I generally enjoy the content you post and these little typos and grammatical errors just detract from the overall authoritativeness and polish of your blog. Matthew don’t worry about the errors. I would rather read your thought as expressed rather than you worrying about occasional simple grammatical things. I understand what you mean. And it gives your blog credibility in my view. Those that want perfection:!read the NYT travel section. Keep up the good work Matthew! Why did you not need a visa for Vietnam? How long were you at the airport? Was only at airport for about 9 hours. Too short of a time to justify going out to a hotel. I’m just not as in love with the qsuite as other people. When stretched into a lie flat, the bed is too short. I’m 5’11” and have to decide which leg will stretch out and which will be at an angle because of the triangle shape of the area where feet are placed. The narrowness of the bed and where your body hits the areas able to adjust is also not as comfortable. I end up recline sleeping as I can’t stretch out. I also don’t like the isolation…at least place a lounge area somewhere for guests who are traveling together, but not a family. Its awkward to have your boss peer over or open your door. And, finally, every other row is rear facing. Guests should know their seat is a backward ride. I didn’t care for this. We are booked in the Qsuites in 3A and 4B. The Qatar agent tells me we can converse within the seats, that a wall can be lowered to allow it. From your pictures, I am not seeing this as a possibility. Can you please confirm this for me.